The reasons people do this are many, but the answer to the question is simple. This creates a weird tension for people in the group or MC. At a church like Revolution, where we discuss the sermon, if you don’t hear the sermon you won’t be able to add to the discussion. So, now you are silent attendee. The other aspect that is incredibly important and this is the real reason people do this (even though they would never tell you this). Attending a church and an MC at another church keeps a person from having accountability in their life or having to submit to authority. They are able to skirt it at both churches, get what they want and go home. No one holds them accountable, gives them pushback for not serving (because they aren’t), not giving (because they usually aren’t because their heart isn’t at either church) and ultimately, they are simply being a consumer at two places and taking it all in instead of giving to anyone through care and serving. On a larger level, this keeps the church who has the MC they attend from growing their church. The consumer getting the best of both churches is taking up a needed seat for someone to get connected at the church. I would say, “It is uncaring to say no to someone who wants to be in an MC at the church they attend that you can’t because we don’t have room because of this person who doesn’t attend our church, doesn’t want to attend our church but wants to be in an MC.” It is uncaring to the person waffling because they are missing the crucial element of accountability that is so important to relationships and community because they go to this place on Sunday and then to our place on Thursday. You can’t have it all and by trying to have it all (attending a church service and an MC at a different church), you actually end up missing the thing you are trying to get. Sign up to receive Chapter 1 of my brand new book "Breathing Room: Stressing Less, Living More." Sign up to receive my blog posts via email and never miss a thing on JoshuaReich.org. ©2019 JoshuaReich.org. Powered by the Get Noticed! Theme. 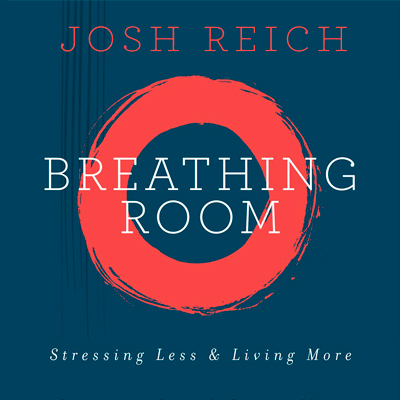 Sign up to receive chapter 1 of my brand new book Breathing Room. You'll also never miss an update from my blog!